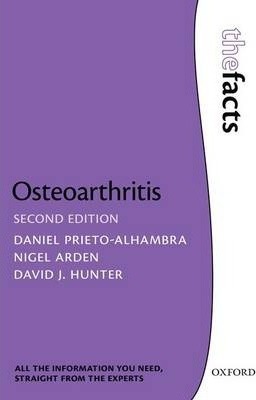 Osteoarthritis: The Facts helps patients and their carers better understand the condition, empowering patients with the knowledge and skills to actively take charge of their own health by knowing as much as they can about osteoarthritis, and finding out how this can be best managed. the reader with an opportunity to educate and empower themselves with tools that will help reduce their suffering. International Osteoarthritis Research Society and an editor for leading international journals in his field. He has authored books on osteoarthritis and has over 250 publications in peer reviewed journals. Dr Daniel Prieto-Alhambra studied Medical Sciences in the period 1996-2002 at the Autonomous University of Barcelona (Barcelona, Spain). He continued his clinical training and became a General Practitioner in 2006. In the years 2007-2009 he obtained an MSc degree in Primary Care Research (Autonomous University of Barcelona, Spain). In June 2009 he moved to Oxford and started working as an Honorary Research Fellow at the Musculoskeletal Epidemiology Unit within the Botnar Research Centre. There Dr Prieto-Alhambra completed the research that led to his PhD on the topic Knee osteoarthritis and fractures: a potential role of bisphosphonates in April 2011. In 2012 he became a Senior Clinical Research Fellow in the Musculoskeletal Epidemiology group and a honorary clinical associate in Bone Metabolism and Rheumatology at the Nuffield Orthopaedics Centre (Headington, Oxford) and Horton Hospital (Banbury).